After beating the game, you can press “Enter” after Captain Viridian say’s “Let’s Go!”, right before the credits show up. Press “Enter” again and you can now return to the game. You can now continue playing the game, even after beating the game. The collision detection on two set of spikes off slightly off in Exhaust Chute as shown in the video. Questions & Theories: Does this happen anywhere else in the game? Using this glitch, you can save the game after most of the variables have been reset. This allows you to clear you game time, number of rescued members, map exploration and anything else except for your currect location and number of shiny trinkets. Be warned; however, that if you do this glitch anywhere by Space Station 1, you will never be able to complete the game, as you will never be able to rescue Violet. 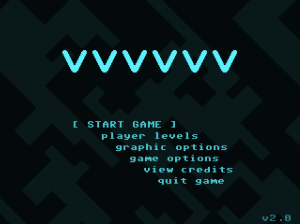 Exit VVVVVV (this glitch needs to be done from a cold start). Load save, and press esc as soon as you can. Choose to quit to menu. If you did #3 right, you should be greeted with a black screen and “Game Saved” should appear. You can still run around and flip, but when you are done, press esc again and you will go to the menu. Voila! Your game save is reset. If you save during the Gravitron area, then load your save, you can make the triggers and objects malfunction. After the 60 seconds, your character will automatically get forced to the right very quickly which crashes the game. It is unconfirmed if this was fixed in version 2.0. This glitch only exists in the demo version of the game. After saving Doctor Victoria, beating the game, and then starting a new game, Doctor Victoria will start in the lower right portion of your screen. The dialog will trigger where you saved her, even though you are just starting the segment. She will switch locations on every screen change and in some instances, follow you around.